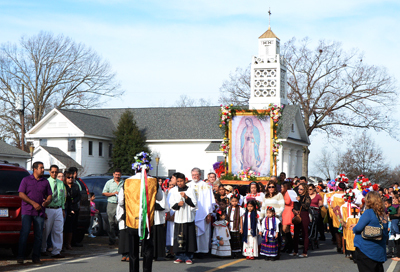 The Redemptorists » Redemptorists return to Newton Grove, N.C.
Father Mark Wise, C.Ss.R., and parishioners of Our Lady of Guadalupe Parish in Newton Grove, N.C., hold a procession on their patron’s feast day. In 1927 the Baltimore Province began the Newton Grove foundation in the most rural county of North Carolina, in a small town that served as a hub to the surrounding localities. A rectory was constructed, and the local Catholic church was assumed, with its satellite missions. The Province erected one of these mission stations as a parish in its own right, with a separate community in nearby Clinton (18 miles south of Newton Grove). In 1953 unique external circumstances occasioned by Bishop Vincent Waters’s desire to “experiment” with integration—uniting the then-separate African-American and Caucasian congregations into one—forced the Redemptorists to abandon the mission: there were no parishioners who would attend the church! In August 2015, after an absence of more than 60 years, the Redemptorists returned to this very mission within the Diocese of Raleigh as a response of the Secretariat of the Apostolate’s discernment to introduce a “new initiative” in the life of the Province/Vice-Province of Richmond. 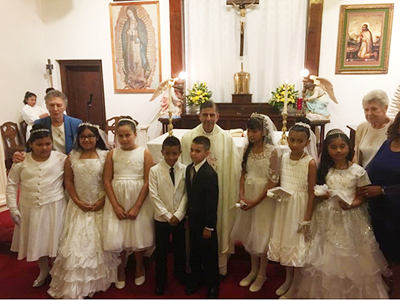 First Communion at Misión San Juan in Ingold, N.C.: With the first communicants and Father Dionne are pastoral associates and Sisters of Divine Providence Maxine Tancraitor and Theresine Gildea. And so the present community of Fathers Joseph Dionne (Vice Province of Richmond), Kevin Moley (former Provincial), and Mark Wise (Baltimore Province) was commissioned to begin anew the project so hastily put asunder in another time but under entirely new circumstances. Sampson County (the locality of its only two Catholic parishes) continues to be the largest and most rural in all North Carolina, some 35 miles east of Fayetteville. Newton Grove, a small township with a native Catholic population (as a result of the conversion of a prominent physician after the Civil War), serves the Catholic population in numerous such localities in the northernmost part of the county. The parish in Newton Grove had originally been called St. Mark, but the Redemptorists had renamed it Most Holy Redeemer. After the Redemptorists’ departure, Bishop Waters dedicated the parish in 1954 to Our Lady of Guadalupe, long before any Mexican set foot in the vicinity. It is a most apt title now, as the greater portion of the Hispanic community, which makes up at least 75 percent of the congregation, is of Mexican origin. 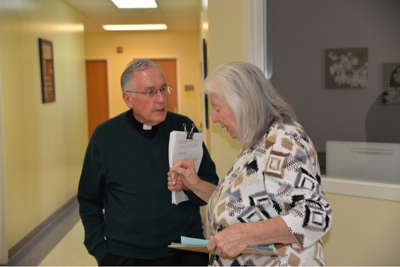 Father Kevin Moley, pastor of Our Lady of Guadalupe in Newton Grove, talks with Ann Herring, the parish director of catechesis. Fathers Moley (pastor) and Wise (pastoral associate) currently attend to the pastoral advancement of the people of God situated in this remote locality. 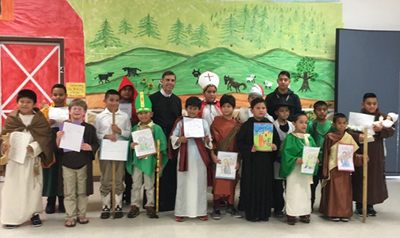 They spent their youth and beyond in the Spanish-speaking Province of San Juan (as did Father Dionne), so they are very well prepared to minister to the Lord’s flock in this time and place. Several ecclesial organizations are part and parcel of parish life (Knights of Columbus, Ladies’ Altar Society, Jovenes para Cristo, Mundo Mejor, etc.). The faith formation program, which draws from the surrounding townships, has more than 400 students enrolled. There are special activities, especially retreats, that also require the Fathers’ attention, as well as diocesan activities (the only Catholic cemetery in the region is located there and provides the final resting place for all deceased bishops and priests of the diocese). Many diocesan-wide events take place in Newton Grove, as it is considered the geographical center of the diocese. The whole county is characterized by its agriculture (cotton and tobacco surely, but also soybean, sweet potato, and corn) and by the innumerable chicken, turkey, and hog farms that dot its landscape. Butterball (turkey) and House of Raeford (chicken) have processing plants nearby, and Smithfield (pork products) is based in Clinton, the county seat, a small town (population 10,000) 18 miles south of Newton Grove. Father Joseph Dionne poses with young parishioners during an All Saints Day celebration at Immaculate Conception in Clinton, N.C.
Father Dionne is pastor of Immaculate Conception Parish in Clinton and administrator of the mission attached to it: San Juan in Ingold, some 13 miles south of Clinton. Although our Hispanic population is largely Mexican, Hondurans make up as much as 30 percent to 40 percent of the Catholics who participate in the life of the Church on a regular basis. Two women religious (Sisters of Divine Providence of Pittsburgh, Pa.) are employed as pastoral associates and direct all faith formation and parish outreach ministries. The distinguishing apostolate introduced by the pastor is the parish retreat movement Cristo Renueva Su Parroquia (in English, Christ Renews His Parish, better known by its acronym, CHRP). This biannual retreat has produced lasting fruits here, as it has in so many other parishes throughout the United States. The “new initiative” is truly an excellent expression of the Redemptorist charism in action. In a very remote and rural place renowned in the diocese for being off the beaten path, we have returned to minister to farmers and farmworkers: the poorest and most abandoned of the Catholic population in these parts.